Innovative Ideas/Novel Notions, Inc. is a manufacturer/supplier of over 1000 high quality specialty products to retail merchants worldwide. Take a moment to browse through our product line. We are sure that you will see the potential for increased revenue in these products. 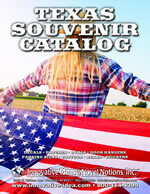 The Lone Star State has many fans and our Texas catalog has all the items they'll want to show their favoritism. We feature iron-on flag patches in the shape of Texas, Texas flag stickers, Texas Chili fixins, vinyl flag decals and much more. 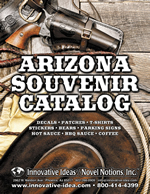 Arizona is second to no one in it's support and our Arizona catalog has all the items you'll want to show off where you've been or where you've chosen to live. We feature iron-on flag patches in the shape of Arizona, mini flag stickers, Arizona vinyl flag decals and much more. 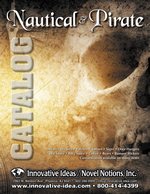 Interested in pirate or nautical themed items then this catalog has them all. Iron-On patches featuring ship anchors, dolphins, Jolly Roger flags, pirate bumper stickers, Jolly Roger flag decals, pirate grub, flag stickers, plus much more. 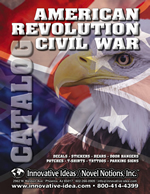 Revive the spirit of the American Revolution and the independence of the Confederacy with our American Revolution and Civel War decals, patches and novelties. Wear your patriotic independence from Washington on your sleeve or proudly display it on your car or truck. Looking for a special sticker to place on that exceptional paper your pupil just turned in?. We have world flag stickers that will not only delight your children but also teach them about the countries they represent. Check out our numbered MarkIt dots and Arrows also. 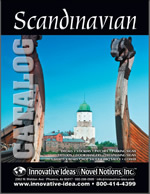 We have grouped all our products from the northern European countries of Norway, Sweden and Denmark. 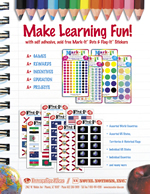 Our Catalog features iron-on flag patches, vinyl fade resistant flag decals, and much more. 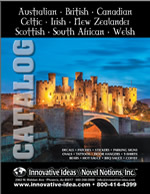 We have grouped all our products from the United Kingdom into this specialty catalog. It features iron-on flag patches from the UK, Wales, Scotland and Ireland, vinyl fade resistant flag decals, self-sticking mini flag stickers and much more. 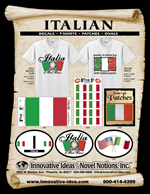 Browse through all of our products from Italy. Our Catalog features iron-on flag patches, vinyl fade resistant flag decals, T-shirts, Sweatshirts and much more. 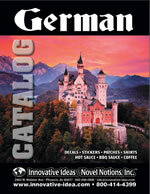 We have grouped all our products from Germany. Our Catalog features iron-on flag patches, vinyl fade resistant flag decals, T-shirts, Sweatshirts and much more. 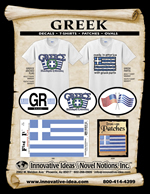 Browse through all of our products from Greece. Our Catalog features iron-on flag patches, vinyl fade resistant flag decals, T-shirts, Sweatshirts and much more. We have grouped all our products from Poland. Our Catalog features iron-on Polish flag patches, vinyl fade resistant Polish flag decals, Poland T-shirts, Sweatshirts and much more. 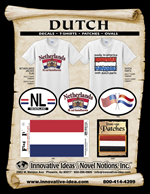 We have grouped all our products from The Netherlands. Our Catalog features iron-on flag patches, vinyl fade resistant flag decals, T-shirts, Sweatshirts and much more. A low minimum order of just $50.00 for any combination of products in your initial order. High Quality, screen-printed T-Shirts made from 6.1 ounce 100% pre-shrunk cotton. Our shirts feature seamless double-needle collars, sleeves and bottom hems with taped necks and shoulders.